There's a lot of love for Man O'War among my gaming buddies of late, so as is the way with these things I was soon swept up in the tidal wave of enthusiasm for this most excellent of Games Workshop games. I always looked at Man O'War as a game I missed the boat on. I had none of the sets, no ships, no rules. There were those in my group that kept the faith (TheOttoVonBismark is a Man O'War fanatic) but I had enough going on. That was until the most recent tsunami of boat love coming primarily out of Sho3box. I resisted as long as I could, but it looked too much fun. With that, I threw my lot in with the forces of Khorne, and the HIM (His Infernal Majesty's) navy was born. Cheers for that one Sean. Getting ships proved to be reasonable enough after I threw out my nets. Getting masts was another matter. 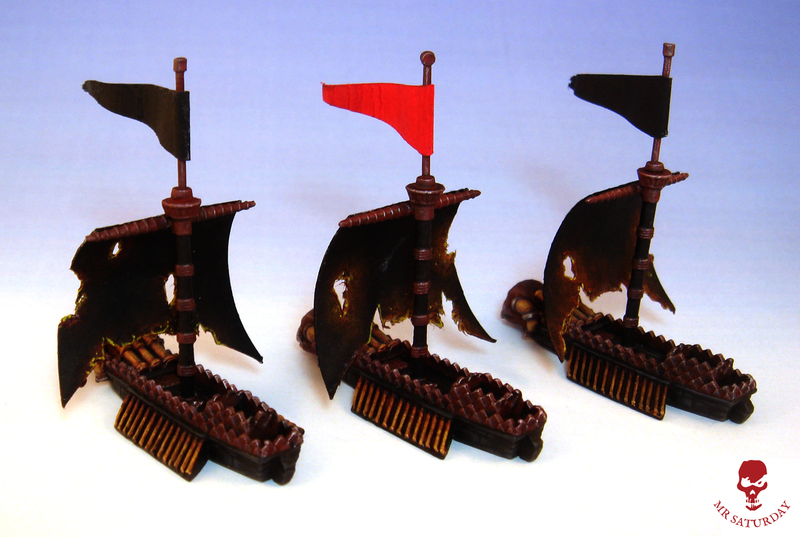 I was initially perplexed as to how to approach assembling and painting the sails. I need a 3 beam? what's that? Triangular sails on the Ironsharks? What? This went on for a while and I badgered all around me for advice. I eventually secured enough mast parts to serve the fleet. The flag poles I made from florists' wire and some plastic rod. 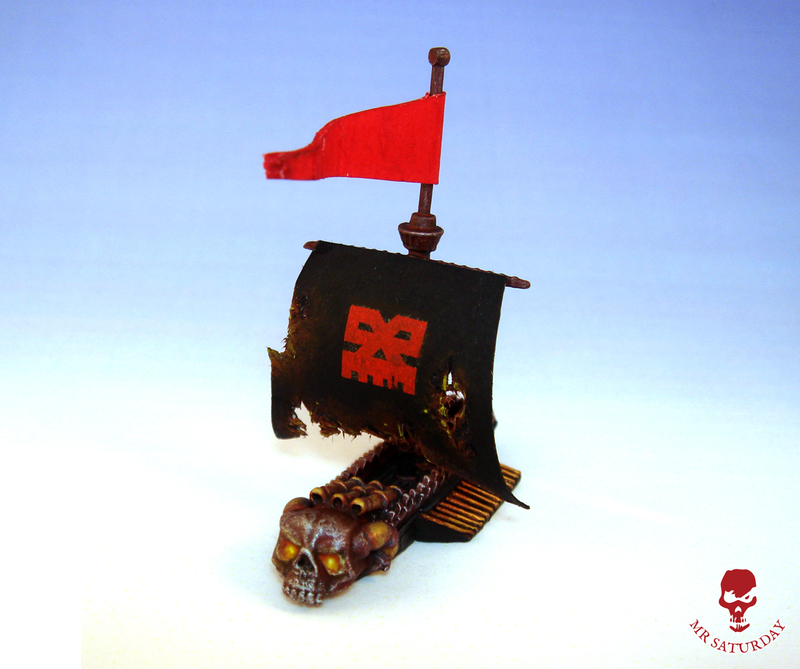 I managed to get a Khorne sail sheet, and made templates for all the sails I would need. I bought some coloured card to cut down on painting. With this scale I had to consciously pull back on texturing and weathering so as not to overwhelm the models. 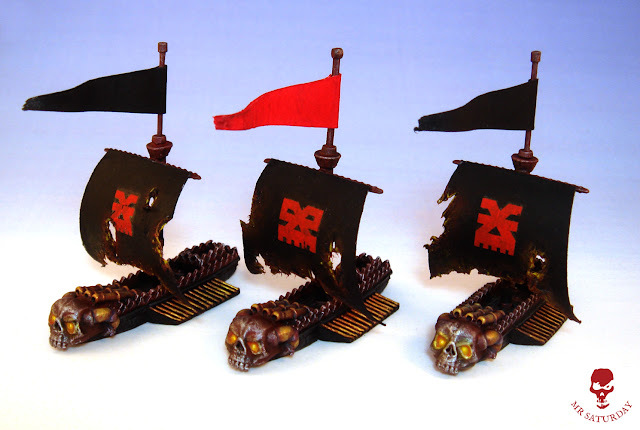 I did add glowing eyes to the skulls and a smouldering effect to the sails to add a little more visual interest. I used some very old transfers on the sails. 26 years old. MicroSol and MicroSet saved the day here, softening the ancient transfers so they would sit nicely on the paper. A quick roll around a wooden dowel to curve the sails, some vanish and done. I attached the sails to the beams with Impact Contact adhesive, which worked like a dream. My gaming pals gave me a ton of solid naming suggestions for the ships. All are crewed by Khornegor. So it was the HIM Bloodhound, Damnation and Brass Retriever were born, collectively the Cogs of War squadron. Next up my flagship, the bloodship Guns of Anarchy.